After Mexico’s 1982 economic crisis, the country abandoned its previous enthusiastically embraced Import Substitution Industrialization (ISI) development strategy, inspired by the Economic Commission for Latin American and the Caribbean (ECLAC) of the United Nations. Since then, the Mexican economy has seen pounded by incredible surges of transformations. Free trade agreements, massive privatization, and financialization have become new pillars of the economy, and have led to a complete reconfiguration of the country. However, twenty years after the ratification of the North American Free Trade Agreement (NAFTA), the positive outcomes of this economic model adjustment have been little, and the expected economic boom never occurred. In fact, poverty and inequality increased during the 1980s and the 1990s, and remains widespread. NAFTA has predominantly benefited the U.S. and Canada: Mexico’s two main trading partners. Mexican authorities might now consider renegotiating NAFTA, and promote an alternative economic development policy, in order to overcome their persistent dependency on the U.S. economy, as well as improve their numerous deficiencies in various economic sectors. Since the emergence of the new political order after the Mexican revolution in 1928 and its stabilization in the 1930s, nationalization, state planning, and sovereignty have largely governed economic policy in the country. Based on the dominant model of economic development at that time of ISI, promoted by the Economic Commission for Latin America and the Caribbean of the United Nations (ECLAC-UN), Mexico practiced protectionism, focusing on its own industrial production and consumer market. The goal was to achieve autonomy by attaining self-sufficiency. ISI is an economic and trade policy that advocates to replace imports with domestic production. Over the decades, ISI was based on the thesis that a country should reduce its foreign dependency by bolstering local production of industrialized products. During the rule of the Mexican hegemonic party, the Institutional Revolution Party (Partido de la Revolucion Institucional, PRI) (1928-2000), whose economic model was based on the nationalized industries inherited from the 1930’s (oil industry, electricity sector, railroad industry) and the redistribution of land (from squirearchy, to local cooperatives called ejidos, which were maintained under local collective administration). This economic model, based on conceptions of the industrialization process and the redistribution of income, which was applied throughout Latin America, but primarily by Brazil, Mexico and Argentina. But in 1982, plunging oil prices in the international market led to a financial crisis and the debt default of the government. This crisis in effect dug a grave for the ISI model, as well as for the administrations of the following three Mexican presidents, Miguel de la Madrid (1982-1988), Carlos Salinas de Gortari (1988-1994) and Ernesto Zedillo Ponce de León (1994-2000). Counseled by the International Monetary Fund (IMF), these aristocratic and self-confident presidents chose a new path of neoliberalism: free trade promotion, privatization of the public sector, and reduction of public spending. This policy, accompanied by high interest rate levels and the creation of a strong peso, led to a drastic reduction of inflation, but also hindered economic growth in the country. The Mexican economy enjoyed ten times more than the traditional international investments in the economy, and the private sector flourished thanks to massive privatization. 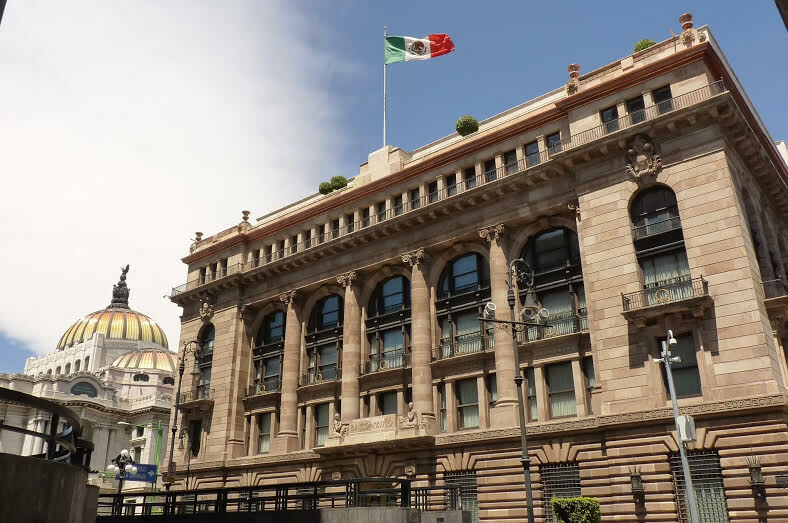 The Mexican economy gained prominence in the international arena, with Mexico joining the General Agreement on Tariffs and Trade (GATT) in 1986, and in 1994, as well as the Organization for Economic Cooperation and Development (OECD). The still non-democratic authorities have also concurrently ratified the North-American Free-Trade Agreement (NAFTA) with Canada and the United States of America. These radical developments, taken together starkly contrasted with the economic stagnation and massive impoverishment rampant in Mexico during the 1980’s. Supposedly representative of the new economic era due to the inception of NAFTA, 1994 was far from a positive year. The opening of Mexico’s non-competitive economy led to an enormous deficit of $18.5 billion USD in the country’s trade balance. Additionally, indigenous populations from the poor, southern region of Chiapas, Mexico, witnessed a guerrilla movement, established the Zapatista Army of National Liberation (Ejército Zapatista de Liberación Nacional, or EZLN), and the declaring of combat against the Mexican central government, considered illegitimate, due to the electoral fraud of 1988, which has been recognized later on. The principal presidential candidate, Luis Donaldo Colosio Murrieta of the PRI, was shot dead during his electoral campaign, which lead to an intense institutional crisis of legitimacy. Due to a guerrilla re-emergence (Mexico knew several guerrilla movements during since the 1960s till the 1980s) and the assassination of PRI’s presidential candidate, international investors panicked, and hastily revoked their funds. Therefore, a new financial crisis arose in Mexico, that in effect devaluated the peso by 50 percent. Twelve years after 1982, Mexico was again unable to face its outstanding debt, with an economic situation even worse than ever before. But this time, because of Mexican authorities’ acceptance of neoliberal economic policies, neither the US government nor the International Monetary Fund (IMF) wished to let Mexico drown. It would have been the in live proof of the failure of economic neoliberalism. In order to save the myth, the U.S. government authorities lent $9 billion to Mexico, and helped its neighbor with a financial swap of around $12.5 billion. Additionally, the IMF lent $17.8 billion to Mexico, seven times more than officially permissible by Mexico for allowed IMF quotas. The 50 percent devaluation of the peso led to a drastic reduction in the Mexican labor force cost, and also reduced the price of comparable Mexican products compared to U.S. and Canadian goods. Therefore, Mexican exports saw significant growth; maquiladoras, factories for parts assembly for industrial products all along the U.S. border, created 100,000 jobs, a major boost for the sector. Since their appearance these assembly plants have been a staple of economic growth for Mexico, principally allowing it to export products to the U.S. market. Today, maquiladoras garner $80 billion a year, around 30 percent of the Mexican Domestic Gross Product (GDP). Despite what the country had hoped, Mexican economic growth has become more and more dependent on the U.S. market, evidenced by the United States absorbing around 80 percent of Mexican exports. Since 1993, Mexico has noticeably become even more integrated in the North American economy. Between the United States and Mexico, trade multiplied five times in the period between 1993-2011. While Mexico today receives 11 percent of American exports, the United States absorbs 80 percent of all Mexican goods. Trade between Mexico and Canada increased as well, also multiplying by a factor of five. In 2010, the intra-regional trade was very important, and several industrial sectors were nearly fully integrated: for example, 75 percent of the automobile industry in North-America, in comparison to 70 percent for the automobile sector among the European Union and 30 percent of that of Asia. In 2013, international investments accounted for 31.5 percent of Mexico’s GDP—a big step up from the 8.5 percent in 1990. Also in the latter year, numerous international firms arrived in Mexico (General Motors, Boeing, Citigroup, Gold Corp, Walmart, etc.). However, only 44 percent of these investments originated from the United States. In contrast, those of the European Union made up around 60 percent of the total. The commercial balance between the United States and its two economic partners in NAFTA has risen each year. Currently estimated to be $106 billion, the balance represents 15 percent of the United States’ deficit. Also, the United States, which has benefited from the inexpensive Mexican workforce, did not lose as many jobs as it had feared at the time of NAFTA’s ratification. The United States lost around 700,000 jobs between 1994 and 2010, but concurrently has created around 40 million new positions because of the electronic and information boom. During the period 1993-2015, the job creation in the United States has been of around 30 millions net. Although the working class may have lost jobs in the United States, many more were created for the qualified labor force. Economic results have been very disappointing for Mexico. The country’s GDP grew only an average 2.9 percent annually between 1993 and 2010, compared to 4.9 percent for Argentina, 4.1 for Brazil and 6.8 for Chile. The average annual growth per capita between 1960 and 1980 was 3.5 percent, 0.7 percent between 1980 and 2000, and of 0.6 percent between 2000 and 2013. In Latin America, even if the difference between the periods between 1960-1980 and 1980-2000 are similar, or even worse, to the Mexican panorama, with figures diminishing from 3.3 percent to 0.4 percent in average annual growth of the GDP per capita, since 2000, the average annual growth in Latin America at the time was three times more than the current one in Mexico. The devastation of jobs in Mexico’s primary sector has been significant since the ratification of the NAFTA. As stated by the Council for Economic and Policy Research, the “NAFTA removed tariffs (but not subsidies) on agricultural goods, with a transition period in which there was a steadily increasing import quota for certain commodities. […] Not surprisingly, U.S. production, which is not only subsidized but had higher average productivity levels than that of Mexico, displaced millions of Mexican farmers.” International agriculture entreprises from the United States, such as ABC Farm and Monsanto, quickly took over the field in Mexico against communitarian ideals and small-scale Mexican farmers. Economic growth is not the only indicator of NAFTA’s failure: the wage gap between Mexico, and the United States and Canada, is very significant. In 2012, the GDP per capita in Mexico was equivalent to 30 percent of the United States’ GDP per capita, and 32 percent in 2011, reflecting a relatively modest increase. Poverty also remains high in Mexico. According to data gathered by the Mexican government, the number of people unable to afford housing, adequate clothing, transportation, healthcare, education and food in 2012 was nearly the same as in 1994 and accounted for 52.4 percent of the population, which is now at 52.3 percent. Mexican authorities were aware that the jobs of many small farmers would be in jeopardy, but they held the belief that the farmers would be able to find alternative jobs. The agricultural sector was also expected to quickly adapt to a high-tech renovation of the field. And in fact, the production of vegetables and fruits have grown considerably, from 17.3 million tons in 1994, to 28.2 million tons in 2012, creating millions of seasonal jobs for the period. But Mexican production focused on the demands of the American market, which means the focus was on counter-seasonal products, and on very specific vegetables, such as onions, strawberries, tomatoes, and cucumbers, amounting to nearly 70 percent of Mexico’s current production. Mono-culture and the intensification of production led to a reduction of population in rural areas, and decreased production for the local market. Mexico must now import corn and rice, staples in the Mexican diet, in order to meet domestic demand. In 2010 Mexico imported 7.27 million tons of yellow corn, 2.93 million tons of white corn, and around 0.7 million ton of rice paddy to meet the local demand of traditional products. Furthermore, most of the farmers who lost their jobs at the time were unable to find other work, and were forced out of desperation to migrate to the United States. The flow of migrants to the United States in 1994 was around 43,000 and rose to 770,000 six years later in 2000. The migration rates later lowered, mainly because of the militarization of the border post 9/11, and because of the 2001 economic recession in the United States. Economically speaking, one of the most impressive aspect of NAFTA for Mexico has been the increased production of manufactured goods and generation of industrial jobs by the maquiladoras. This model had been implemented in Mexico prior to NAFTA, but under reduced conditions. Since 1965, the Mexican government has created various free trade zones in order to receive production units from the United States, with intentions of subcontracting U.S. industrial production. Within these free trade spaces, Mexico could import resources and partially manufactured products for assembly, essentially creating poor quality jobs with little aggregate value to the manufactured product. The base of the term maquiladoras is maquilar in Spanish; the government was quite literally, simply applying a bit of makeup to industrial products, to add some little transformation, mainly assembly, and re-exporting these products to the United States. At the time of these earlier free trade zones, most enterprises present were U.S.-based, but European (Philips in Ciudad Juarez) and Asian (Sony and Hunday) ones also participated. These free trade zones benefited a specific exemption from the ISI model at that time, which was based on self-sufficiency and protectionism. Gaining importance in the 1990s with NAFTA, these zones enabled Mexican enterprises to benefit from free trade and free tax zones called PITEX (Programa de Importación Temporal para Exportación). Progressively, maquiladoras became the only factor contributing to the industrialization of the country, greatly structuring the sector. Today, these maquiladoras produce 80 percent of exports in Mexico, mostly for the United States. Mexico is now seen as a cheap site to assemble products before exportation to the United States. The increase in maquiladoras had also very negative effects on the conditions of working class women, many times sexualized and wildly exploited. The number of femicided women rose considerably in Northern Mexico during these last twenty years. Another sector of Mexico saw exponential growth: service. These developments are evidenced by the arrival of supermarkets and call centers. The growth of these sectors provided employment for young migrants returning to Mexico from the United States, who could then work in the call centers with the English that they had acquired abroad. As in the industrial sector, these kinds of employment are mainly for unskilled workers and are notoriously underpaid. Repercussions of NAFTA and the new economic model in Mexico are undeniable. Primarily, the downsides have been a concentration of the industry in maquiladoras and U.S.-bound exports. The intensification of agriculture on off-season crops and the development of the service sector are also notable and negative outcomes. Overall, newly created jobs are poorly paid, produce really little added value, and only deepen Mexican dependency on the U.S. economy. Furthermore, the re-configuration of the industry and disruption of traditional agriculture in Mexico led to a massive flow of migration to the United States. The 2000-2001 recession in the United States demonstrated the limitations of the new economic model and integration policy promoted by the U.S., IMF, and implemented via NAFTA. While Mexico’s GDP growth was seven percent in 2000, it fell 0.3 percent in 2001, and only grew slightly in the following years at 0.9 percent in 2002 and around one percent in 2003. The maquiladora crisis led to massive lay off of 200,000 people between 2001 and 2003, in Mexico. Economic growth in Mexico coincides with a strong dependence on the U.S. In 2008-2009, the Mexican GDP plunged more than the U.S. GDP, and once again there was a massive depletion of jobs; Mexico has been more of a victim than the U.S. in this sense. This dependence is a problem, both politically and economically. After the ratification of NAFTA, the number of poor Mexicans increased from 40 to 60 million, as according to the Consejo Nacional de Evaluación de la Política de Desarrollo Social (CONEVAL). Millions of small and medium Mexican enterprises have closed, prices have increased due to an adjustment to international markets, and subsidies were cut for Mexican farmers. Also, American goods arrived much faster than the capital necessary to industrialize the country. The local Mexican market is now flooded with “made in USA” products, while the country’s exports are merely assembled in the country, with little added value in the process. Mexican export growth is at the mercy of the U.S. market’s absorption capacity, which is limited, because already filled with products from other countries, such as China. Domestically, the free trade policy led to a collapse of traditional Mexican industries (small and medium-sized enterprises and industries, SMEs and SMIs), which are facing an unsustainable competition: U.S. products are heavily subsidized (agriculture and steel), and the goods are available at reasonable prices. In Mexico, banks do not lend at less than a 25 percent interest rate, while it is way more affordable to borrow money in the United States. This strong asymmetry prevented the Mexican industry from investing, resulting in a high rate of bankruptcy. In the competition for assembly of products and manufactured goods, Mexico is now obligated to maintain low wages to profit from maquiladoras, if it wants to maintain cheap prices for the experts, able to compete with Chinese and Asian production, and reduce consumerism in the local market so as not to disturb the equilibrium of the Mexican trade balance. This economic policy, which is just one among many other outcomes, which can lead to an unbearable inequality in the distribution of the wealth. Based on NAFTA, this economic model allowed neoliberal governments to partly dismantle what constituted the base of a welfare state, born out of the Mexican Revolution, and created during the mandate of former President Lazaro Cardenas and Avila Camacho (creation of the Mexican Social Security Institute in 1943, raise of wages, social insurance, etc.) While preparing the foundation of the ALCA, the Free Trade Area of the Americas, American presidents Bill Clinton and George W. Bush were willing to extend the new free trade area from Alaska to Tierra del Fuego. Also, since its transition to a weak democracy in 2000, Mexico has aligned its foreign policy with the United States, specifically regarding Latin America and the War on Drugs. Drug trafficking has become a major component of U.S.-Mexican relations. According to the U.S. Secret Service, the southwestern border of the country is the main entrance and drug storage area for the U.S. market (cocaine, heroin, marijuana, synthetic products), which is the biggest drug market in the world. The situation has worsened in Mexico, particularly since the 1980s; until then, drug traffickers were mostly smugglers whose main function was to bring Colombian cocaine to the United States, and had a tacit agreement with Mexican federal authorities, allowing a certain degree of peace. Since the opening of the Mexican economy at the time, the country has ceased to merely be a transit space, and is now a space of production and consumption. Mexican cartels have become richer and stronger. The most powerful have become true transnational corporations protected by militias and paramilitary groups. Overarching income of narco-trafficking fluctuates around $20 billion USD per year. This money has plagued almost all economic and political sectors of the country, fueling violence and corruption. A survey commissioned by the Mexican Senate has estimated that about 72 percent of Mexican municipalities could be infiltrated by men or women in the drug trafficking industry, and 8 percent could be completely controlled by cartels. Encouraged and perpetuated by the United States’ War on Drugs, the Mexican government has lead a war against the cartels since 2004, resulting in thousands of casualties: the homicide rate in the country has doubled, from around 10 per 100,000 inhabitants in 2004, to more than 20 in 2012. NAFTA definitely allowed Mexico to raise its export potential, but only to the benefit of the North American market. The Mexican economy is completely dependent on its northern neighbors. Mexico depends on its export industry, but also on remittances received from emigrants living in the United States, and from the direct foreign investment in the country, primarily coming from the United States. In 2005 it was estimated that trade relations with Canada and the U.S. represented 95 percent of Mexican total expenditure, including oil exports, manufactured goods, agricultural export, and import of capital goods with high value added. Since the beginning of the twenty-first century, the government of Mexico has tried to connect with global economic partners by promoting similar free trade agreements—a strategy of the United States as well. The U.S. has ratified free trade agreements with El Salvador, Honduras, Guatemala, Peru, Costa Rica, Nicaragua, Chile, and the Dominican Republic. Mexico and Canada have also promoted such economic policies. Mexico has ratified free trade agreement with Japan, Colombia, Venezuela, Peru, Guatemala, Uruguay, El Salvador, and Honduras. 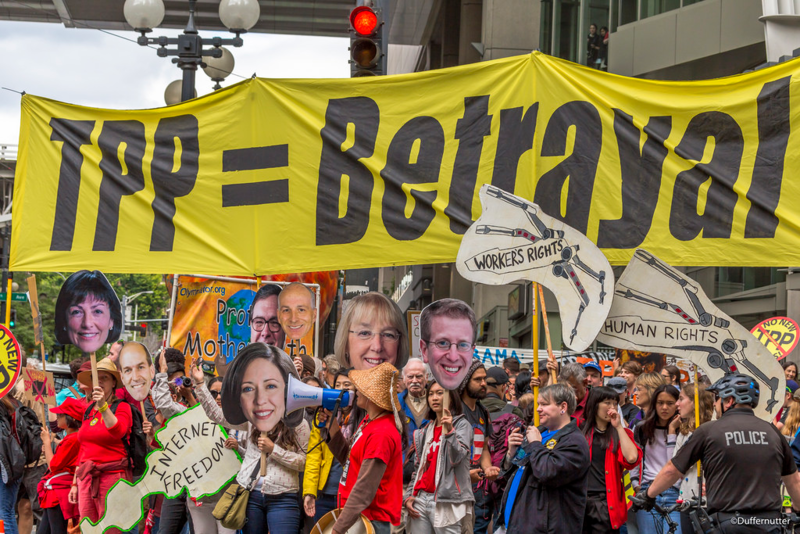 The United States government is now trying to negotiate a Trans-Pacific Free Trade Agreement with the European Union. More recently, in 2011, Mexico joined the Pacific Alliance, a free trade alliance including Colombia, Peru, Mexico, and Chile that aims to stand up to the incredible trade power of China. Through this partnership, Mexico is trying to diversify its economic standings and to export more towards Latin America and Europe: the goal is to retract its dependency on the United States. The Pacific Alliance, for instance, represents a potential market of around 100 million inhabitants, and a 70 percent GDP growth during the period 2007-2012 (previous to the Pacific Alliance. Mexico is looking to develop its relationship with other Latin American countries of similar ideological beliefs; for example, Colombia and Chile, who present a counter-bloc to confront Brazilian hegemony, and the growth of other regional blocs, such as the Bolivarian Alliance for the Peoples of Our America (Alianza Bolivariana para los Pueblos de Nuestra América) ALBA and the Mercosur or Mercosul (Mercado Común del Sur, Mercado Comum do Sul), which promote more protectionist policies and anti-free market standings (or at least anti U.S. conceived free market trade agreements). The multiplication of economic and trade partners has become the main goal of Mexican foreign policy in Latin America, in order to challenge South American leadership in the hemisphere. Mexico, like other countries in South America, developed an important trade relationship with China. Trade between the two countries rose from $4.4 billion USD in 2000, to $62.6 billion in 2012. Even though China and Mexico are in direct competition for the U.S. consumer market, Mexico is the second highest receptor of Chinese produced goods. In 2013, because of the increase of oil in the international market and the constant rise of wages in China, it became cheaper to produce or assemble products in Mexico, rather than in China. Mexican authorities are hopeful that Mexico will become a new “little China” in North America. However, a direct cooperation has evolved between Mexico and China. China opened its market to Mexican pork and tequila, and many bilateral agreements were ratified during an official visit of Chinese president Xi Jinping in June 2013, including an agreement related to the energy sector in prevision of the opening of the oil market in Mexico, and also regarding infrastructure. Petróleos Mexicanos (Pemex), the state-owned Mexican petroleum company announced, for example, a loan from the Export-Import Bank of China of almost $1 billion to allow the purchase of new oil boats and the exploration of new oil fields in deep offshore waters of the Mexican Gulf. Neoliberalism in Mexico, as we have demonstrated, is wildly unsuccessful. The economy is terribly dependent on the U.S. market, the jobs created are poor in quality, and added value to manufactured goods is low. Mexico’s agricultural sector has been devastated by the competition from heavily subsidized U.S. crops, and the industrial and service sector can only offer low-paid, unskilled work. Mexico is industrializing its economy, but only for low-cost manufacturing in which it faces ferocious competition with other countries, such as China. Mexico has become the assembly gate for the enormous U.S. market, but poverty and inequality persist. These figures indicate that profit margins greatly increased, but the rise in profit was only accumulated by the richest in Mexico. Economic growth in Mexico is fueled by exploitation of the poor, considering that a fundamental element of its economic growth is based on a low-cost workforce. A successful economic model intends to improve the quality of life, and promote economic abundance for a country’s population, ideally providing access to better education and health care. The economic model in Mexico is evidently rooted in capitalizing on severe inequality and widespread poverty, provoking economic growth and profits margins for an elite minority. Such a model is not only unsuccessful, but also immoral. 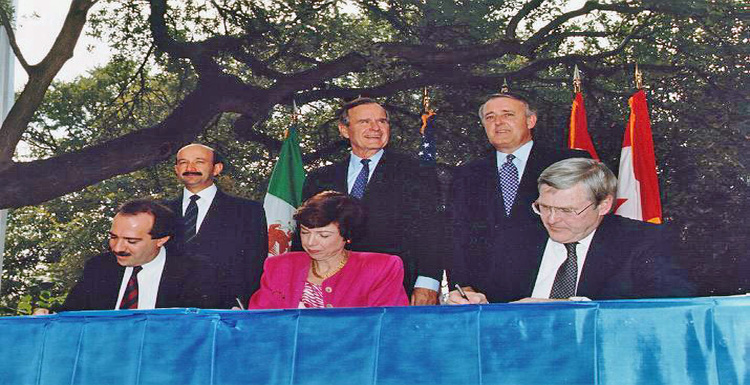 Featured Image: The George Bush Presidential Library and Museum, “North American Free Trade Agreement,” Retrieved from WikiCommons,http://en.wikipedia.org/wiki/North_American_Free_Trade_Agreement#/media/File:Nafta.jpg. See more in -MUSSET Alain et GHORRA-GOBIN Cynthia, Canada, Etats-Unis, Mexique, Sedes, 2012 ; BIZBERG Ilan, « La sociedad civil en el nuevo regimen politico », Foro internacional, Vol. XLVII, Numéro 4, Octubre-Diciembre 2007, pp. 785-816., El Colegio de Mexico, Mexico ; BEY Marguerite, « Réformes néolibérales et tensions sur les ressources dans la décentralisation au Pérou et au Mexique », Revue Internationale de Politique Comparée, Vol. 17, n° 3, 2010 ; BEY Marguerite, DEHOUVE Danièle (dir. ), La transition démocratique au Mexique, Regards croisés, L’Harmattan, Paris, 2006 ; BIZBERG Ilan, “La transformation politique du Mexique: fin de l’ancien régime et apparition du nouveau ? », in Critique Internationale, n°19, avril 2003. WEISBROT Mark, LEFEBVRE Stephan, SAMMUT Joseph, “Did NAFTA Help Mexico? An Assessment After 20 Years” Council for Economic and Policy Research, February 2014. Consulted on http://www.cepr.net/index.php/publications/reports/nafta-20-years on April 8, 2015. KROZER Alice, MORENO BRID Juan Carlos, “Inequality in Mexico”, World Economics Association, pp.4-6 of World Economics Association Newsletter 4(5), October 2014. Consulted on http://www.worldeconomicsassociation.org/newsletterarticles/inequality-in-mexico/ on April 8, 2015. BIZBERG Ilan, “La transformation politique du Mexique: fin de l’ancien régime et apparition du nouveau ? », in Critique Internationale, n°19, avril 2003 ; GILLY Adolfo, La revolución interrumpida, México, ERA, 2000. BAER Werner, “Import Substitution and Industrialization in Latin Amercia: Experiences and Interpretations” in Latin American Research Review, Vol. 7, No. 1 (Spring, 1972), pp. 95-122. STREET, James H.; DILMUS James, “Structuralism, and Dependency in Latin America.” Journal of Economic Issues, 1992 16(3) p. 673-689. STREET, James H.; DILMUS James, “Structuralism, and Dependency in Latin America.” Journal of Economic Issues, 1992 16(3) p. 673-689. BAER Werner, “Import Substitution and Industrialization in Latin Amercia: Experiences and Interpretations” in Latin American Research Review, Vol. 7, No. 1 (Spring, 1972), pp. 95-122 ; ARNAUD Pascal, “ Industrialisation et crise économique : le Brésil et le Mexique, 1970-1982 » Revue Tiers Monde, 1982, Volume 23, Numéro 91, pp. 669-677. PANIAGUA-RUIZ, Rafael, “Crise financière et problème de la dette: les limites de l’intervention publique entre 1978 et 1981” in Revue Tiers Monde, 1984, vol. 25, issue 99, pages 659-667. SI PAZ, “Chiapas – Peace Process, War Process, on January 3, 2000. Consulted on http://www.sipaz.org/en/chiapas/peace-process-war-process/334-1994.html ; THOMPSON Ginger, “Ex-President in Mexico Casts New Light on Rigged 1988 Election” The New York Times, March 9, 2004. Consulted on http://www.nytimes.com/2004/03/09/world/ex-president-in-mexico-casts-new-light-on-rigged-1988-election.html on April 6, 2015. Historia de México, coordinación de Gisela von Wobeser, México, Fondo de Cultura Económica, Secretaría de Educación Pública, 2010. (Reimpresión, 2014). CAMDESSUS Michel, “La crise financière mexicaine, ses origines, la réponse du FMI et les enseignements à en tirer,”Revue d’économie financière, 1995, Volume 33, Numéro 33, pp. 35-45. TRUMAN Edwin, “The Mexican Peso Crisis:Implications for International Finance” in Federal Reserve Bulletin, March 1996. VILLAREAL Angeles, “U.S.-Mexico Economic Relations:Trends, Issues, and Implications” in Congressional Research Service, July 1, 2014. PARIS Frank, MARTINAUD Claude, BOILLET Pierre-Yves, Canada, Etats-Unis, Mexique, Capes-Agrégation Géographie, Collection: Je prépare, Dunod, 2012. ; MUSSET Alain et GHORRA-GOBIN Cynthia, Canada, Etats-Unis, Mexique, Sedes, 2012. The method and the details of measure provided per the Consejo Nacional de Evaluación de la Política de Desarrollo Social (CONEVAL) is findable on the following link http://www.coneval.gob.mx/Medicion/Paginas/Medici%C3%B3n/Pobreza%202012/pobreza_2012_ingles/2012_poverty_measurement.aspx Consulted on April 8, 2015.
ttp://www.jstor.org/discover/10.1525/msem.2005.21.1.59?sid=21106307668183&uid=3739256&uid=2&uid=4 on April 9, 2015. MCKIBBEN Cameron, “NAFTA and Drug Trafficking: Perpetuating Violence and the Illicit Supply Chain” Council on Hemispheric Affairs, March 20, 2015. Consulted on http://www.coha.org/nafta-and-drug-trafficking-perpetuating-violence-and-the-illicit-supply-chain/ on April 8, 2015. REUTERS, “En México la mano de obra es más barata que en China” in la Jornada, April 5, 2013. Consulted on http://www.jornada.unam.mx/2013/04/05/economia/027n3eco on April 6, 2015. COHEN Luc, “Mexico’s Poverty Rate: Half Of Country’s Population Lives In Poverty”, in the Huffington Post, July, 29 , 2013. Consulted on http://www.huffingtonpost.com/2013/07/29/mexico-poverty_n_3673568.html on April 8, 2015. -SARTORI Giovanni, Partidos y sistemas de partidos : marco para un análisis, Madrid, Alianza, 1992. -BARTRA VERGES Armando, Los herederos de Zapata: movimientos campesinos pos revolucionarios en México 1920/1980, México, ERA, 1985. -GILLY Adolfo, La revolución interrumpida, México, ERA, 2000. -BEY Marguerite, « Le programme social progreso-oportunidades au Mexique », Revue Tiers-Monde, n°196, octobre-décembre 2008. -BEY Marguerite, « Réformes néolibérales et tensions sur les ressources dans la décentralisation au Pérou et au Mexique », Revue Internationale de Politique Comparée, Vol. 17, n° 3, 2010. -BEY Marguerite, DEHOUVE Danièle (dir. ), La transition démocratique au Mexique, Regards croisés, L’Harmattan, Paris, 2006. -BIZBERG Ilan, « La sociedad civil en el nuevo regimen politico », Foro internacional, Vol. XLVII, Numéro 4, Octubre-Diciembre 2007, pp. 785-816., El Colegio de Mexico, Mexico. -COMBES Hélène, « La guerre des mots dans la transition mexicaine », Mots, Les langages du politique, 2007/3 n°85, p. 51-64. -MUSSET Alain et GHORRA-GOBIN Cynthia, Canada, Etats-Unis, Mexique, Sedes, 2012. – MUSSET Alain, Le Mexique, Que sais-je ?, Presses Universitaires de France (PUF), 2010. -REUTERS, « China, Mexico vow broad cooperation as Xi visits; no trade pact soon », June 4, 2013. -SALIBA, Frédéric, « Chine et Mexique réchauffent les relation », Le Monde, June 5, 2013. -DE CORDOBA, José, GUTHRIE, Amy, « Mexico, Chine seek to jump-start trade », Wall Street Journal, June 4, 2013. -REUTERS, “En México la mano de obra es más barata que en China” in la Jornada, April 5, 2013. Consulted on http://www.jornada.unam.mx/2013/04/05/economia/027n3eco on April 6, 2015.